Slideshow on right: We Make Makers! The new Innovation Labs, Makerspaces, and Learning Commons. You can play this slideshow full screen and see the videos of this presentation by clicking on the youtube or vimeo links, or by playing the Innovation Labs and Makerspaces Videos at the bottom of this page. Download the PPT here. August 29, 2016: GHS Innovation Lab, Greenwich High School, Greenwich, CT. See new video from July, 2016. May 12, 2016: Pine Crest School Innovation Institute, Maker Movement: A Constructionist Approach to Inspiring Innovation and STEAM Learning, Ft. Lauderdale, FL, Thurs-Fri, June 9-10, 2016. Pre-Conference Workshops: Wednesday, June 8, 2016. December 11, 2015: How to Host a Maker Dine and Design Evening, blog from the Mount Vernon Institute for Innovation (MVIPI). See more about MVIFI below. October 16, 2015: FUSE 2016 conference: Design Thinking Experience, June 15-17, Atlanta, GA. Led by the Mount Vernon Institute for Innovation. September 22, 2015: New edutopia video Maker Education in Albemarle County Public Schools. Also see web profile of Albemarle County Schools. September 1, 2015: 4-week Fall 2015 Maker Workshop online course from School Library Journal starts 9/16. Register here, $80. June 13, 2015: MakeSchools Higher Education Alliance: State of Making Report, June 2015. Explore 40 Higher Education Institutions. 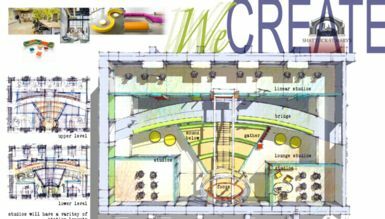 The weCREATE Center is a 2 story interior space that offers a cross-fertilization of creative skills for high school students at Shattuck-St. Mary's School. 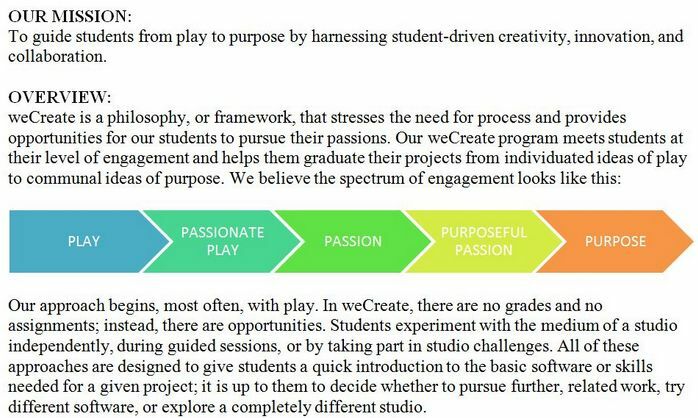 At the weCREATE Center there are no grades and no assignments, instead there are opportunities - see mission and philosophy below. 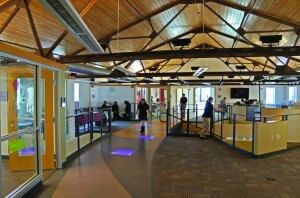 The Innovation Lab @Ross is an Academy for Entrepreneurship in Science, Mathematics, Engineering, Media, and Technology. Innovation Lab @Ross is an academy within Ross School that is designed for students who are passionate about science, mathematics, engineering, media, and technology. 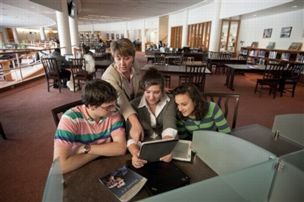 This stimulating and rigorous program enables students to conduct independent research and undertake self-directed learning in such fields as electronics, computer programming, marine science, and digital media. EXPLORE, INQUIRE, ENGAGE: At Innovation Lab @Ross, students learn firsthand about the need for novel, interdisciplinary thinking in order to succeed in the global economy of the future. 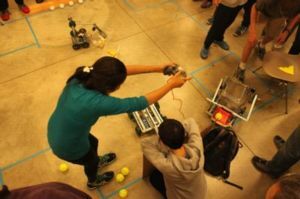 Whether building robots, designing machines, or collecting data in the field, Innovation Lab students develop essential engineering, design, and media skills as part of their individualized program of study. Combining these engineering and design skills with directed reading and independent research, students tackle independent projects of their own design. Students are also encouraged to study the commercial aspects of innovation and to approach their projects from an entrepreneurial angle. 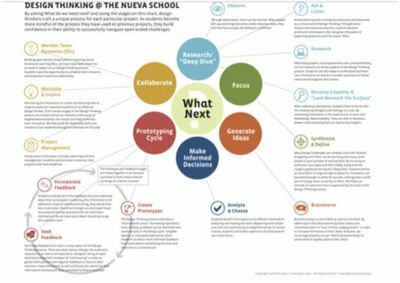 The success of Nueva School's I-Lab has inspired a more integrated design thinking-based design for their new high school, which is under construction. Design Education at the Nueva School from LUNAR on Vimeo. 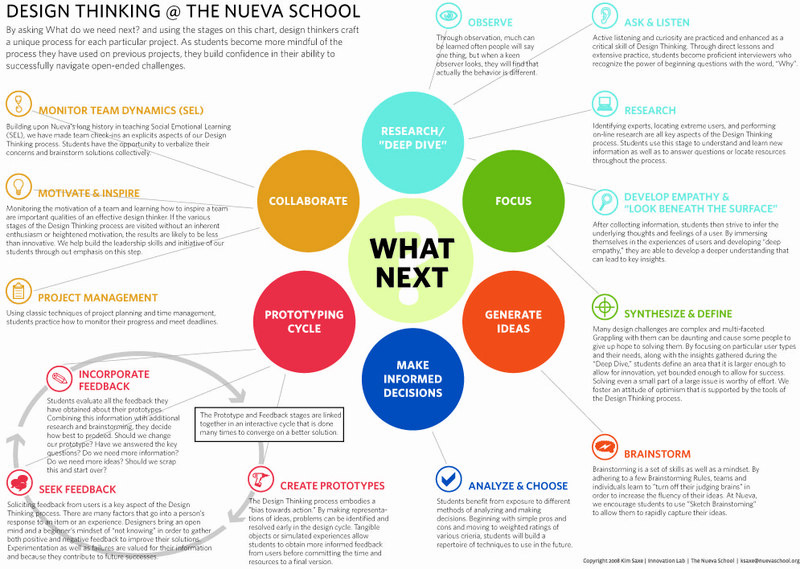 To see the Nueva Design Thinking Process, click on the chart. Innovative Learning Conference 2017, October 19-20, 2017. 2015 Conference materials. School Make/Innovation Spaces, By Lindsey Own, November 8, 2013. Blog re innovation and maker spaces at Nueva School, Menlo School, and Castilleja. Quest Academy is reintroducing and expanding a new program designed to provide middle school students with a focused and integrated exploration of Engineering, Technology, Arts, and Digital Citizenship to supplement current offerings in Science and Math. This newly enhanced STEAM (Science-Technology-Engineering-Arts-Math) curriculum will provide new opportunities for learning and inquiry. Lower School students will use the Innovation Lab in their Technology and Art curriculum in addition to periodic technology-based learning in Math, Science and Language Arts. 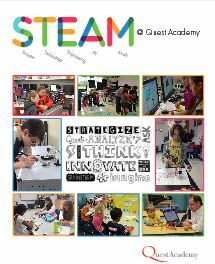 Video: Creating a Maker Mindset (2013), by Vinnie Vronty and Sheryl Peterson, on the development of Quest Academy's makerspace and maker culture. 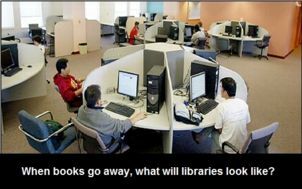 As they say in the video, you can't build the space without building the culture and pedagogy in with it. Multi-faceted Refractions Blog: Thoughts and Reflections from Vinnie Vrotny, Director of Academic Technology at the Quest Academy, Palatine IL. This blog chronicles the vision, pedagogy, physical design, and implementation of the Innovation Lab. 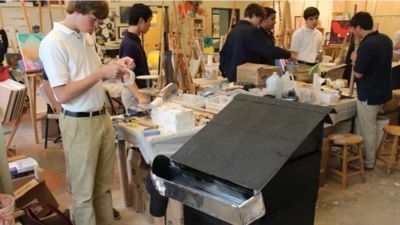 Launched in 2010, Mount Vernon's Center for Design Thinking focuses on human-centered problem solving with an emphasis on collaboration, creativity, and empathy. Students engage in the D.E.E.P. 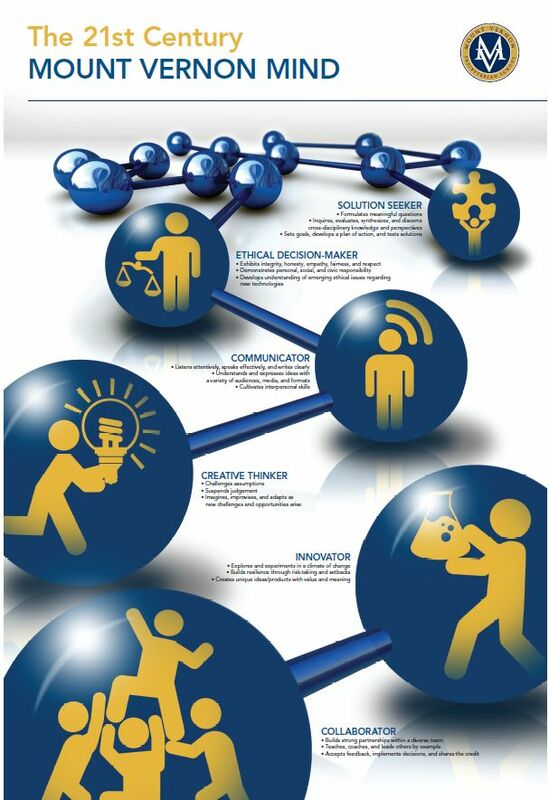 process--Discover, Empathize, Experiment, Produce--a methodology aligned with Stanford University's Institute of Design. Mount Vernon students identify real world issues, collaborate through research, test their results, and produce prototypes to impact the world. FUSE 2016 conference: Design Thinking Experience, June 15-17, 2016, Atlanta, GA. Led by the Mount Vernon Institute for Innovation. The HIVE Playbook. List of tools, supplies, and furniture that went into the HIVE. Design Movement: 21st century Learning and Leadership - Hosted by Dr. Brett Jacobsen, Head of School at Mount Vernon Presbyterian School, Design Movement is a 21st century learning and leadership conversation of creative collaborators in education, business, and the non-profit community. it's about learning: exploring the educational crossroads of our time, Blog by Bo Adams, Chief Learning and Innovation Officer, Mount Vernon Presbyterian School. Also, Bo Adams on Twitter at @boadams1. January 22, 2015: Northen Kentucky Kids make a Makerspace. Video. Story 1. Story 2. NKY Makerspace on Facebook. January 22, 2015: Gary Stager's Invent to Learn Maker Lab shopping list for elementary schools. Spreadsheet-PDF. Spreadsheet-Excel. We Make Makers. Join Us!